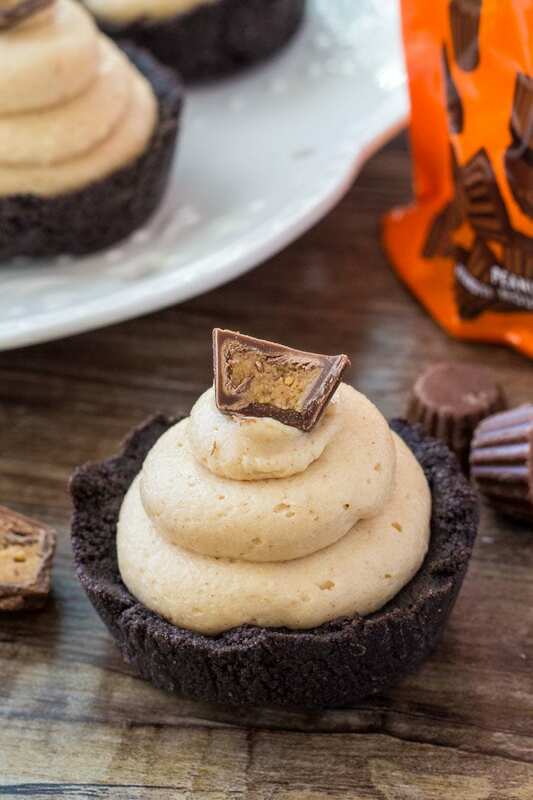 These no bake mini peanut butter cheesecakes are a completely adorable, creamy, salty-sweet peanut butter treat.They have a crunchy Oreo cookie crust, smooth peanut butter cheesecake filling and are topped with a peanut butter cup. It’s no secret that I love cheesecake. Creamy, smooth, and decadent with a cookie crust – what’s not to love? But lately I’ve been obsessing over mini desserts. 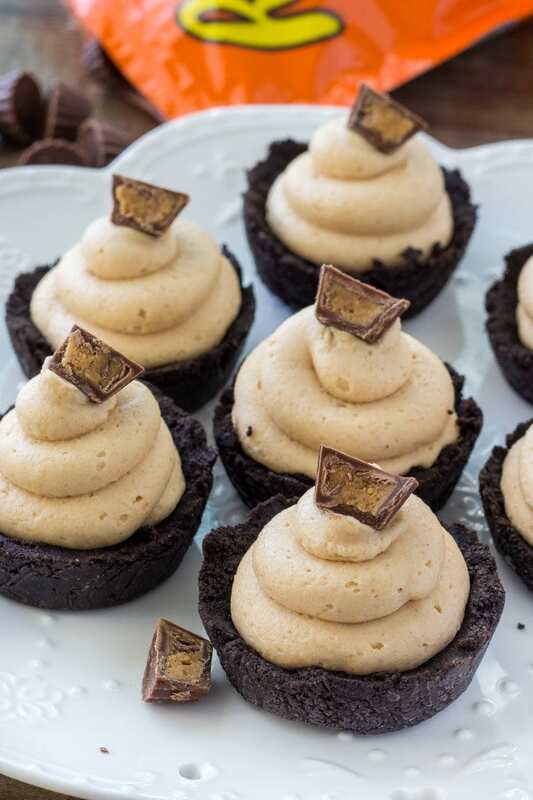 So it only seemed like logical step to share these no bake mini peanut butter cheesecakes with you. They’re absolutely adorable and have a deliciously creamy, dreamy peanut butter cheesecake flavor. Plus – they’re way easier than making a baked cheesecake – since there’s no risk of cheesecake cracks, and you can easily make them in under 30 minutes plus chilling time. These mini peanut butter cheesecakes are also so perfect for potlucks, since they’re completely ready to serve and there’s no need for messing around with cutting cake. 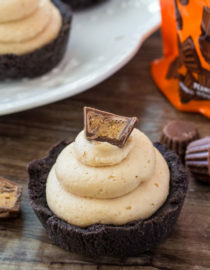 And I don’t think anyone can resist a mini cheesecake with an Oreo cookie crust, peanut butter deliciousness, and topped with a peanut butter cup. For the Oreo cookie crust, we’re basically making tart shells out of crushed Oreo cookies and melted butter. First line a muffin pan with plastic wrap (you’ll need 1 or 2 sheets depending on the size of your roll), and press it down into each muffin cavity. Then mix together the crushed Oreos and melted butter, and divide the mixture between the 12 muffin wells. You’ll press the mixture down into the bottom and up the sides about 1/2 way to create little tart shell shapes – then pop the pan in the freezer while you make the peanut butter filling. 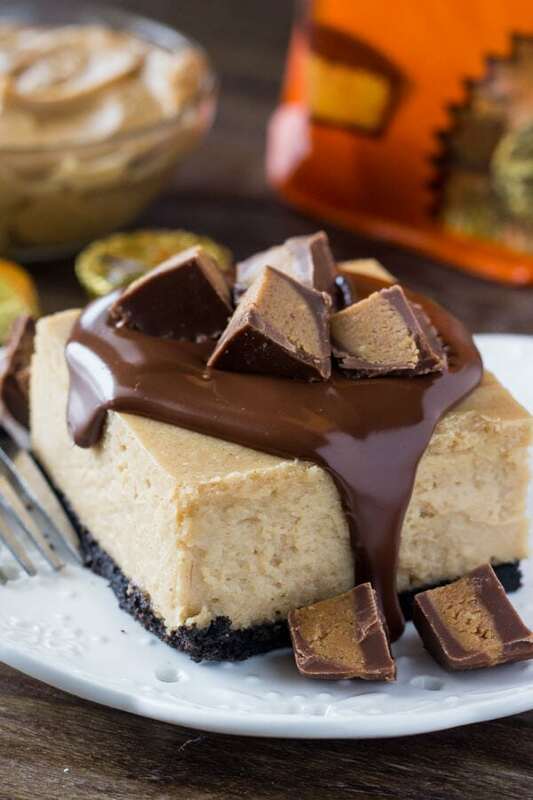 The no bake peanut butter cheesecake is super easy to make and only uses a few ingredients. Can You Use Fat Free Cream Cheese for Cheesecake? I definitely recommend using full-fat, brick style cream cheese for this recipe. I found that other varieties were too soft and the cheesecakes didn’t really set properly. To make the peanut butter cheesecake – first beat the cream cheese until soft, and then mix in the powdered sugar and peanut butter. Gently fold in the whipped topping – and then it’s time to assemble the cheesecakes. You can either spoon the filling between the 12 Oreo crusts – or spoon the filling into a piping bag and swirl it on top of each. I used the piping bag and a round 1M tip. If you don’t have a piping bag, you can also spoon it into a large, heavy duty ziploc bag. Then cut off the bottom corner and use it as a piping bag. Then pop them in the freezer for 30 minutes to chill, or the fridge if it’ll be longer before you enjoy them. These mini no bake peanut butter cheesecakes are so easy to make, filled with peanut butter goodness, and have the most delicious creamy cheesecake texture. If you’re looking for an easy peanut butter dessert that always impresses – then these are definitely for you. 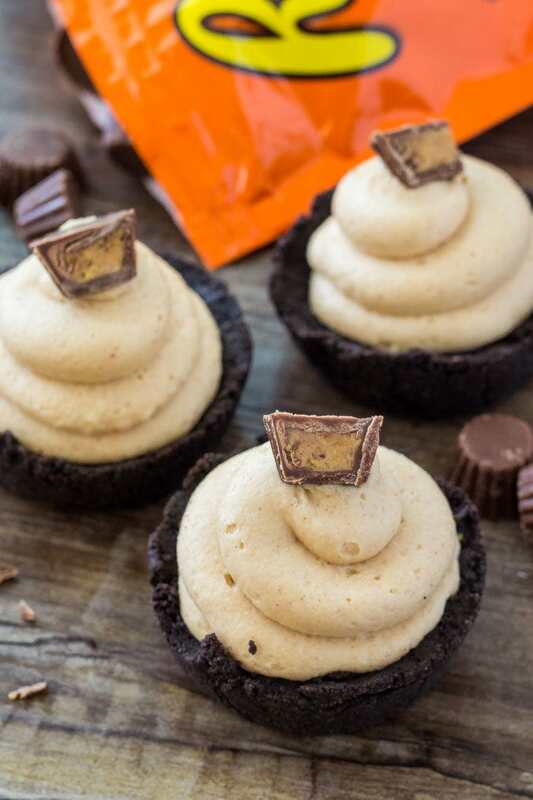 These no bake mini peanut butter cheesecakes are a completely adorable, creamy, salty-sweet peanut butter treat. Crush the Oreo cookies in a food processor or by hand. 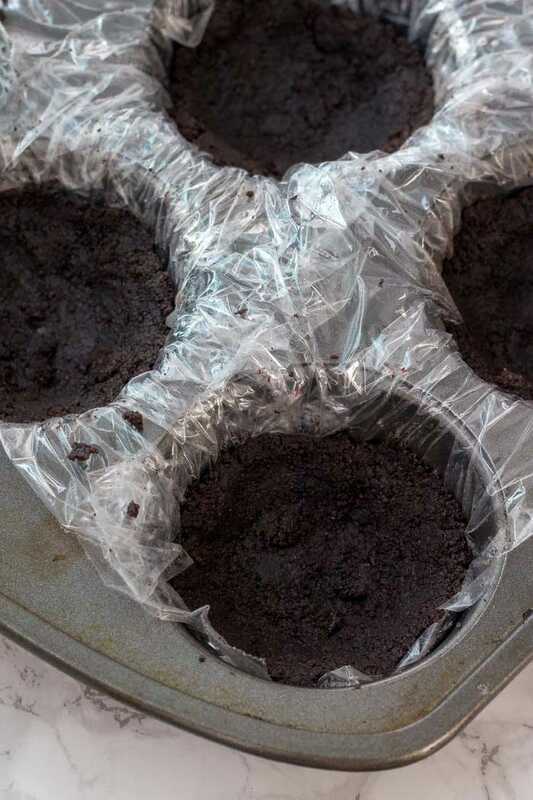 Line a muffin pan with plastic wrap (you’ll need 1-2 sheets), and press it down into each muffin cavity. Divide the Oreo mixture evenly between the 12 muffin cavities, then press the mixture down to cover the bottom and about 1/3 to 1/2 way up each side to create a little well/ tart shell shape. In a large bowl beat the cream cheese until smooth using an electric mixer. Beat in the powdered sugar and peanut butter. Gently fold in the whipped topping until the mixture is even. Spoon the mixture on top of each Oreo crust. Or spoon the mixture into a piping bag with a round tip (I used a 1M) or into a large, heavy duty ziploc bag and cut off the bottom corner. Then swirl it on top of each Oreo crust. Place in the freezer to set for 30 minutes, or in the fridge to set for 2 hours. Decorate each with a mini peanut butter cup, chopped peanuts or mini chocolate chips. *Store cheesecakes in the fridge in an airtight container. 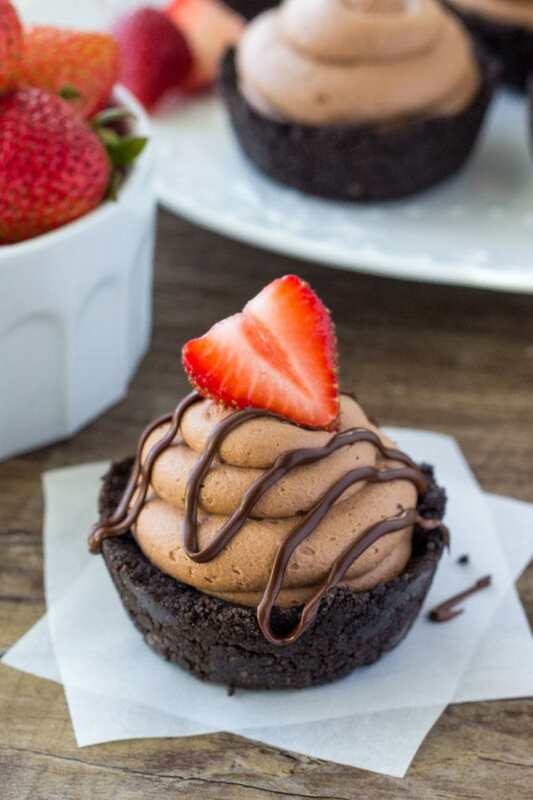 If you love no bake cheesecake, then definitely try these no bake mini chocolate cheesecakes. They’re extra creamy with a delicious chocolate flavor and Oreo crust. For a traditional, baked cheesecake recipe – try these peanut butter cheesecake squares. Creamy, peanut butter deliciousness!